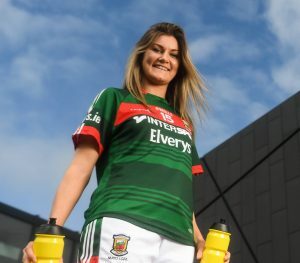 Grace Kelly was among the scorers for Mayo against Westmeath. win over Westmeath following a pulsating encounter in Mullingar yesterday. The game was originally fixed to be played in Cusack Park but it was moved to St Loman’s GAA Club in the town on Sunday morning due to a waterlogged Cusack Park surface. Played in very windy conditions, this was a key game for both sides as they sought to end their losing streaks, but with a seven-point lead to their name at half-time, Mayo held on to win. With Westmeath being managed by a Mayo man in Sean Finnegan, and Mayo having Westmeath native Peter Leahy at the helm, there was an interesting sideshow to this battle, but Leahy’s side picked up the points to ease their relegation worries. For Westmeath, this is now four straight loss leaving only Monaghan are below them in the standings, but on another day they could have edged this clash. The home side outscored their opponents 1-4 to 0-3 in an excellent second-half, but their comeback fell agonisingly short. After a slow start, Westmeath started to improve with a flurry of points from Sarah Dillon before Anna Jones palmed a much-needed goal for the home side. But Mayo hit back and scored their third goal after 15 minutes with Fiona Doherty applying the finishing touch to make it 3-5 to 1-3. Mayo continued to be the better team coming up to half-time with brilliant points from Fiona Doherty and Kearns, although Sarah Dillon and Maud-Annie Foley impressed for the Midlanders to close the deficit to 3-9 to 1-8 at half-time. If Mayo bossed the first-half, Westmeath dominated the second, and they claimed four unanswered scores to start the half, including a second goal for Jones. But try as they might Westmeath could never pull close enough and three Mayo frees staved off the powerful charge from the home side. The win leaves Mayo still in with a slim chance of qualifying for the league semi-finals but will need wins in their two remaining games, at home to Cork this Sunday and away to Monaghan in the final round the following weekend, to have any chance of finishing in the top four. This victory has eased their relegation fears considerably though, moving them up to fifth in the Division 1 table ahead of Monaghan, Westmeath and Tipperary. Monaghan and Tipp’ face off in a key relegation battle next weekend, the loser of which will almost certainly go down, while a win in either of Mayo’s final two matches should be enough to preserve Leahy’s side’s Division 1 status for another year. Elsewhere in Division 1, Galway became the first team to secure a place in the semifinals as they claimed a fifth straight win away to Tipperary on Saturday evening. First-half goals from Leanne Coen and Roisin Leonard helped Tim Rabbitte’s side to a hard-fought 2-14 to 2-9 win. There were also wins for Cork, who hammered Donegal by 3-16 to 0-4, and Dublin, who were 5-14 to 3-10 winners over Monaghan. Westmeath: Sarah Dillon 0-7 (2f), Anna Jones 2-0, Leanne Slevin 0-2f, Fiona Claffey, Johanna Maher and Annie Dolan 0-1 each. Mayo: Fiona Doherty 1-2, Sinead Cafferky 1-1, Grace Kelly 0-3 (2f), Tamara O’Connor 1-0, Natasha Gaughan (2f) and Rachel Kearns (1f) 0-2 each, Ciara McManamon and Niamh Kelly 0-1 each. WESTMEATH: Karen Walsh; Rachel Dillon, Jennifer Rodgers, Lucy Power; Fiona Coyle, Fiona Claffey, Nicole Feery; Anna Jones, Johanna Maher; Karen McDermott, Maud-Annie Foley, Lucy McCartan; Sarah Dillon, Jess Hennessy, Annie Dolan. Subs: Kelly Boyce Jordan (for Feery 17), Sarah Dolan (for A Dolan 32), Leanne Slevin (for Hennessy 34). MAYO: Laura Brennan; Nicola O’Malley, Roisin Flynn, Ella Brennan; Kathryn Sullivan, Ciara McManamon, Danielle Caldwell; Clodagh McManamon, Dayna Finn; Sinead Cafferky, Tamara O’Connor, Niamh Kelly; Fiona Doherty, Rachel Kearns, Grace Kelly. Subs: Emma Neeham (for Brennan 17), Natasha Gaughan (for Clodagh McManaman 22), Roisin Durkin (for Doherty 36).